Uh-oh. I braced myself. 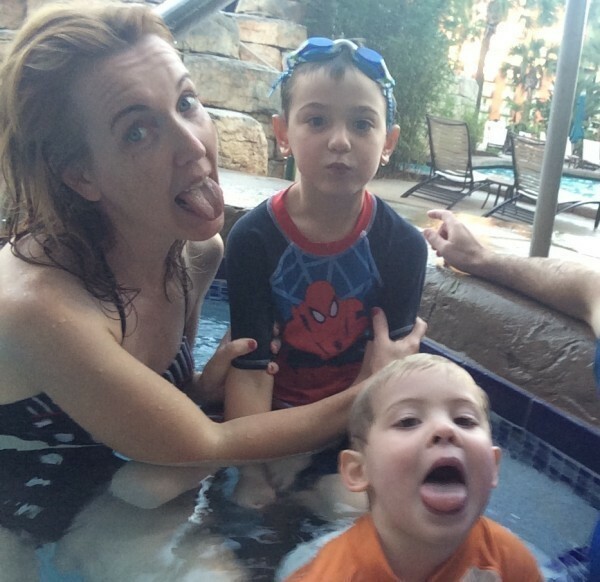 My husband had taken the boys down to the pool about a half-hour earlier (I may have whimpered something about “giving Mommy TWO SECONDS of peace and quiet” as I bolted the hotel door behind them). I looked at them now, happily playing in the shallow end with their dad. Looked innocent enough, but with a 5-year-old and a 2-year-old, you never know. Had they been splashing? Playing too rough? Not supervised properly (I cast a suspicious eye on my husband)? Had my 5-year-old been shouting his new favorite word, POOPFART, at the top of his lungs? Was the little one hungry? Were they not sufficiently covered in SPF 50 and UV-blocking hats and swimwear? Were they disturbing people? And then she walked away — an angel in a Lands' End skirted swimsuit who just rocked my world. Don’t get me wrong — I know my sons are good, happy kids. They’re fantastic little people and I know I’m a darn good mom. But I also know they’re rambunctious and silly and loud. I love them exactly as they are, but parenting two spirited boys in public can be rough. I’ve been shushed, I’ve been parent-shamed, I’ve gotten the stink eye… I can handle it. But being parent-praised in public was something new, surprising, and totally delightful. Nobody should need some random stranger to validate their parenting. Honestly, I don’t. But, also honestly? It felt really, really good. So I made a promise right then and there: I will pay it forward. I will look for opportunities to make another mom feel good about herself. All it takes is a quick word: “You’re doing a good job, mom.” A little step out of our own comfort zones could be the lifeline another mom needs. It’s something we can ALL do for each other, and for ourselves. Later that morning, I chatted more with the angel in the skirted swimsuit — she had three children, the youngest now in college, and she fondly remembered the days of bringing little ones to the pool. (She was one of those older moms who remembered that this experience was both fun AND hard.) I didn’t get a chance to learn much more, because someone needed a snack and someone scraped his knee and someone lost his toy in the deep end and before long it was time to re-apply sunscreen and… well, you know how it goes. I’m sure she doesn’t know the impact her words had on me. I wish I had told her, from the bottom of my heart, thank you. But I will never forget her. Rebecca Dube is a senior editor at TODAY.com and the head of TODAY Parents, Digital. She has two adorable sons, a wicked Diet Coke habit and mountains of unwashed laundry.